Wedding days can seem quite long to little children, so why not add that unique, essential element to your wedding day by hiring our beautiful party bus. 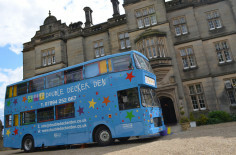 We will drive to your wedding venue to add that special wow factor for your youngest party guests. If you’re looking for alternative wedding entertainment ideas, then why not speak to us and we can present our personalised wedding package, with lots of party additions to keep the little ones entertained. Making everything special for your big day. If your venue doesn’t have much room for little ones to run around or the seasonal weather might not be great, then our party bus is an ideal choice. Every child gets to sit in the ‘drivers seat’ and your wedding photographer is welcome to pop on board and capture their fun and excitement as they enjoy their special treat. That extra wow to your wedding photo album on your day to remember. @creeperhoodie36 We can't predict when the bus breaks down as it was on it's way to you from a previous party. @northumbriana Pleased the girls enjoyed their party. @helenwatson2015 Hi Helen, Thank you for the feedback we are really please the children had a great time on board! RT @theshipley: . @DoubleDeckerDen brilliant - thanks. There is plenty of room & people can always use our loos!